Camera assignment for TLC's "Hoarding: Buried Alive"
production of “Hoarding: Buried Alive” asked Peter Roof to fill in for a crew member and run a second camera. The series goes inside the homes of extreme hoarders to explore the psychology behind their compulsion to accumulate and store large quantities of nonessential things. On this week-long assignment the “before” material was gathered along with the beginnings of a complete clean up of the subject’s home. 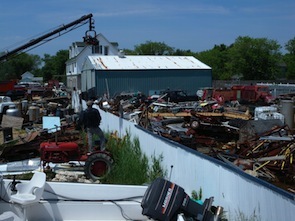 This hoarder lives in a rural area on Maryland’s southern Eastern Shore and had filled his house and entire property with equipment, machinery, parts, books, furniture, and papers. Two Panasonic HDX900 cameras cover the main interaction with the subject, friends, counselors, and volunteers. 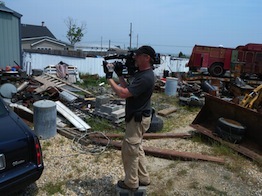 A few POV cameras view the clean-up efforts from loaders and time-lapse of dumpsters filling up. As you can imagine, the working conditions were harsh. Moving around was difficult since there were rusty pieces of machinery everywhere and narrow pathways around the place. Bug spray and sunscreen had to be applied regularly. You had to stage gear in a designated area for fear of having your accessories swallowed into the piles of junk. The location was so remote that most of the b-roll depicting the community did not show any people. The completed episode aired in August.